Xiaomi Redmi 2S, world’s cheapest 4G LTE smartphone and best budget smartphone with 64-bit Qualcomm Snapdragon 410 processor finally launched in China on 4th Jan. 2015 slated to be available in Chines market from 9th January 2015 at CNY 699 (Approx. Rs. 7,100) in Yellow, Pink, Green, White, and Black colours option. If you are an Indian than it will cost you Approx Rs 7,000 will be available this March. 2015. The all new Xiaomi Redmi 2S supports Dual-SIM(GSM+WCDMA) G LTE, 3G, GSM/ EDGE, WCDMA, LTE FDD, and TD-LTE comes with a bigger 4.7”-inch Full HD display with (720×1280 ppi) resolution and 312ppi and AGC Dragontrail™ scratch-resistant glass. 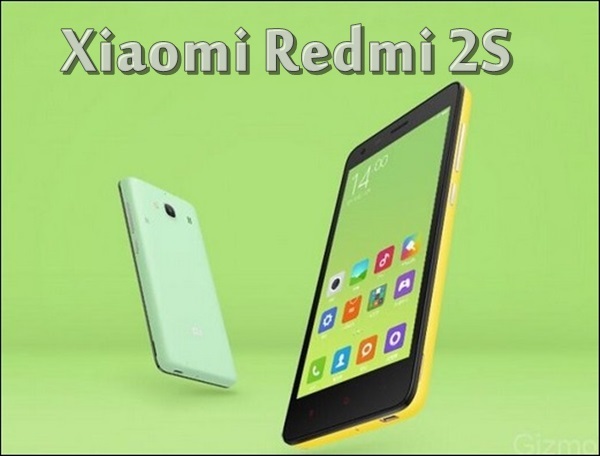 Redmi 2S will offer you mind blowing multi-tasking with Android 4.4 kitkat dubbed with company’s own MIUI 6 skin over and 64-bit 1.2GHz Qualcomm Snapdragon 410 processor (Cortex A53), Adreno 306 GPU with 1GB RAM, 8GB internal memory expandable up to 32GB via MicroSd card. Xiaomi Redmi 2S sporting a 8-MP rear camera with ƒ/2.2 aperture, 28mm wide angle lens and up to 720p at 120fps and 1080p at 60fps, With an extra large 1.4ųm sensor and a 5 plastic lens, you can take photos with accurate, true-to-life colors in low light while 2- megapixel camera is perfect for HD video chatting at 720p. Redmi 2 be powered by a powerful 2200mAh battery including Mi Sound Hi-Fi System with Dirac sound technologies measures 134×67.21×9.2mm and weight 132gm which is 26gm lighter than Redmi 1S. Xiaomi going to launch Redmi Note 2 smartphone on 15th Jan. 2015 priced at Rs at 1499 Yuan ( Approx. ₹15000/$245) in White colour option. According to rumors, upcoming Xiaomi Redmi Note 2 will support Dual-SIM(GSM+WCDMA), 4GLTE, NFC, Wi-fI, Bluetooth come with a bigger 5.5-inch Full HD display with 1080p resolution and Glass-film-film (GFF) architecture powered by a powerful 64 bit-Snapdragon 615, Eight core Soc processor and run on Android 5.0 Lollipop OS for superior user interference and blazing multi-tasking. Xiaomi Redmi Note 2 will sport a powerful 16-MP rear camera with f/2.2 aperture and dual-LED flash and Sony CMOS sensors for shooting and 8-MP rear camera for video calling and selfies will powered by a powerful 35,00mAh battery. Xiaomi will also launch world’s cheapest 4G LTE smartphone, Xiaomi Redmi 2S with Android Kitkat, 64-bit Qualcomm Snapdragon 410 processor and 8-MP Camera which slated to launch at an Event on 4th January at CES 2015 priced at Rs 4,000($65) along with Xiaomi Mi Laptop, Xiaomi Arch, Mi5, Xiaomi Redmi Note 2 and MiPad 2. At last few honest word from heart that the all new Xiaomi Redmi 2S is coming to rule the budget phone market in India. What you think? For more, please stay Tuned…. may i know the release date in india?